Rio Tinto Coal Mozambique (RTCM) was a wholly owned subsidiary of Rio Tinto. In April 2011 Rio Tinto took control of Riversdale Mining, which had the title to the Benga coal mine, the Moatize mine and other coal tenements. However, after a US$2.8 billion writedown on its Mozambique assets in early 2013, Rio Tinto appointed UBS to advise it on selling its Mozambique operations. In July 2014 Rio Tinto announced that it had sold RTCM to International Coal Ventures Private Limited (ICVL) for US$50 million "subject to certain conditions precedent and regulatory approvals." Rio Tinto stated that "the transaction is expected to close in the third quarter of 2014" and that during the transition it would continue to manage the mine. The Benga mine, which started production in late 2011, can only currently export its coal via the 660 kilometre-long general cargo Sena railway to Beira port. Vale also uses the railway for its coal exports. However, the railway has limited capacity and is subject to flooding. In February 2013 flooding resulted in the railway being shut down for several weeks forcing Vale and Rio Tinto to suspend exports. Beira port has limited capacity and also requires constant dredging to remain operational. Coal exports via the railway line have also been disrupted following violent clashes between the ruling Front for the Liberation of Mozambique (Frelimo) and its former civil war combatants, Renamo. The Sena railway runs near Renamo's stronghold in the Gorongosa area. In June 2013 Renamo threatened to block the railway line following government troops moving into the area near Beira Port following an attack on a government arms depot in which six soldiers were killed. Following the clashes Rio Tinto stated that it had "paused our operations on the rail line while we assess the current situation in Mozambique." In December 2010 Rio Tinto proposed a $A3.9 billion takeover of Riversdale Mining. The company stated that the "acquisition provides Rio Tinto with a substantial tier one coking coal development pipeline in the emerging Moatize Basin in Mozambique, in line with Rio Tinto's strategy of developing large, long-life, low operating cost assets to grow shareholder value." At the time Doug Ritchie, Rio Tinto chief executive Energy, stated that "Rio Tinto's extensive experience in infrastructure and large project development combined with our significant financial capacity means that we are well placed to take Riversdale's asset base through its next phase of development. We believe Rio Tinto is one of the few groups in the world with the capabilities, values and incentives to develop the projects quickly and to a world-class standard, bringing considerable benefit to the people of Mozambique." Rio Tinto gained a majority of the company's shares in April 2011. At the time Rio Tinto stated that the "the growth prospects for the Riversdale assets are considerable. We remain optimistic about the outlook for the global coking coal market. This is a great opportunity for our business to deliver on the development of a large-scale coking coal resource". Rio Tinto stated that the Benga project had been granted a mining concession "with initial coal for export scheduled before the end of the year." In a July 2011 presentation Andrew Woodley, Executive Director Riversdale Mozambique Limitada, described the Moatize Basin as the "world's next major coal basin" with premium hard coking coal and high energy thermal coal" and "low cost, long life operations". In his presentation Woodley stated that the Benga mine would begin exports in late 2011 and that the adjoining Zambeze project had "potential" to be in production in "late 2014". Woodley also pointed to the Tete East Project as the company's "third Tier 1" hard coking coal project and that it had the "ability to leverage off Benga and Zambeze logistics systems." The critical hurdle for the projects though was getting the coal to the market. Rio Tinto's initial focus was on exports from the Benga project on the recently re-opened Sena railway and the associated upgrading of Berth 8 at Beira Port. However, as a long-term option, the Sena railway had significant limitations. The capacity of the line was limited, other coal companies were also using the railway, the route was vulnerable to flooding, one section of it was passed though a stronghold of former civil war combatants and Beira Port would require constant dredging. For these reasons Rio Tinto was keen to pursue the option of barging coal down the Zambezi River. In his July 2011 presentation Woodley outlined that the environmental and social impact assessment repiorts had been lodged in April 2011 and public meeting held the following month. Woodley suggested that a "target date for approval" was September or October 2011. If approval was forthcoming, Woodley suggested that the construction of coal loading facilities could begin in February 2012, the dredging of a channel in May and that barging could commence in 2014. "Technical studies," on the barging option, Woodley stated, were "underway." In his presentation Woodley also stressed the need for "solutions sought for long term logistics for export of coal from MoatizeBasin." In Rio Tinto's view, a "solution" needed to "supplement existing/upgraded Beira & Nacala export corridors", "cater for future growth" and "provide a catalyst for further socio-economic development in region." To pursue this, Woodley stated that a "steering group" had been formed, and that a "Coal Industry Export Initiative Study" was "underway" which was "supported by Mozambique Coal Development Association." Woodley concluded his presentation proclaiming that Rio Tinto was an "alternative supplier of coking coal". 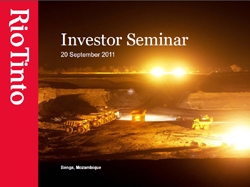 A few months later the company's head optimism remained with a photo of a floodlight Benga mine leading a presentation for investors in London and New York. Rio Tinto's CEO Energy, Doug Ritchie, described the company's Mozambique operations as the "greatest undeveloped seaborne coking coal region in the world." In his presentation Ritchie outlined that the company's target was to produce 5.3 million run of mine coal from the Benga mine. Of this the company estimated it would produce 1.5 million tonnes of hard coking coal and 900,000 tonnes of thermal coal by 2013. From there the company planned the construction of three additional modular coal handling plants and ramp production up to 20 million tonnes a year. Of that, it estimated it would produce 6 million tonnes of hard coking coal and 4 million tonnes of thermal coal. Ritchie suggested that the first of the three additional processing plant modules would be operation in 2015. The expansion plans for the Zambezi project were even more ambitious. Ritchie stated that the company expected first production to occur by 2015 and that by 2019 the mine would have a capacity of 42 million tonnes per annum runs of mine coal. Of this, it estimated it would be producing 10 million tonnes a year of hard coking coal and 6 million tonnes of thermal coal. The company also planned to have the proposed Benga Power Plant completed by late 2015 and the Tete East project coming online by late 2016. But for the massive ramp up plans of the company hinged on major transport infrastructure expansions. The company was counting on an upgrade of the Sena line - which has been proposed to be improved to cater for 15 -20 million tonnes a year, establishing the Zambezi River barging operation and the commissioning of a greenfield railway line by late 2016. “It is about matching the best-value projects to deliver the most valuable tonnes of coal in what is currently a very constrained infrastructure environment,” Ritchie said. For Rio Tinto, its Mozambique dream was aimed at transforming it from a bit-part metallurgical coal producer into a significant player. In late 2011, Rio Tinto's metallurgical coal operation in Queensland produced just 9 million tonnes. The Australian Financial Review reported that Deutsche Bank analyst Paul Young anticipated that Rio Tinto would be producing 16 million tonnes of coking coal from Mozambique by 2020 as long as the infrastructure was developed. The whole grand expansion plan hinged on three factors: the world coal price - and particularly metallurgical coal - remaining high; the touted ratios of the higher priced met coal to thermal coal proving accurate and getting approval for the Zambezi River barging option to allow a rapid expansion of the Benga mine. Quite reasonably, RTCM expected that metallurgical coal produced in Mozambique would enjoy a significant advantage over coal produced in Queensland in the Brazil and India - both of which had rapidly growing steel industries. Just months after Ritchies up-beat assessment of the companies growth option, the river barging option hit a snag. The Mozambican Government rejected the proposal to dredge the river. Mozambiquan Transport Minister, Paulo Zucula, said that the impact of the barging option was "very negative.” “As proposed, it is not doable ... The Zambezi River . . . every four years we have problems with flooding and killing people. So if you’re going to dredge the river, expand the banks, we will be in trouble,” he told Reuters. Instead, he preferred the development of the proposed railway line to Nacala port. "An impairment charge of $2,860 million post-tax was also recognised relating to Rio Tinto Coal Mozambique (‘RTCM’). The development of infrastructure in Mozambique to support the undeveloped coal asset is more challenging than initially anticipated which, combined with a downward revision to estimates of recoverable coking coal volumes, have led to a reassessment of the overall scale and ramp up schedule of RTCM and consequently to the assessment of its FVLCS" [Fair Value Less Costs to Sell]." "However, sales volumes will be constrained by coal chain infrastructure in the near term. The development of infrastructure to support the coal assets is more challenging than Rio Tinto originally anticipated. Rio Tinto sought to transport coal by barge along the Zambezi River, but this option did not receive formal approvals. These infrastructure constraints, combined with a downward revision to estimates of recoverable coking coal volumes on the RTCM tenements, have led to a reassessment of the overall scale and ramp up schedule of RTCM, and consequently to the impairment. Rio Tinto continues to engage with the Government of Mozambique on all transport infrastructure options." As a consequence of the writedown on its Mozambique assets, Rio Tinto sacked Doug Ritchie. In a media release the company stated that Ritchie had "who led the acquisition and integration of the Mozambique coal assets in his previous role as Energy chief executive." The company stated that the the "Rio Tinto Board fully acknowledges that a write-down of this scale in relation to the relatively recent Mozambique acquisition is unacceptable." In February 2013 Rio Tinto's chief executive, Sam Walsh, stated that divesting the company's Mozambique assets was not a part of the company's plan. "I would be hopeful that there is upside in the project," he said. "I should just confirm that Mozambique is not part of the divestment [program]." However, in late June 2013 it was reported that the company was "seeking to sell part or all of the assets amid growing political turmoil in the region and the need to develop a long-term infrastructure solution." The Australian Financial Review reported that "the Sena rail line is not considered a long-term solution" for the company which "has been searching for an Indian or Chinese partner on its Mozambique coal assets since the write-downs in January to reduce its risk and funding burden." 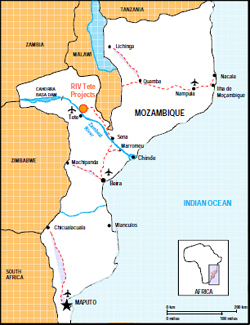 On its website Rio Tinto States that RTCM "Rio Tinto Coal Mozambique holds mining and exploration licences in the Moatize Basin in the Tete province of Mozambique." the Zululand Anthracite Colliery (74 per cent). ↑ Sarah Thompson and Anthony Macdonald, "Rio appoints UBS to manage Mozambique assets sale", Australian Financial Review, June 27, 2013. Subscription required). ↑ 2.0 2.1 Rio Tinto, "Rio Tinto agrees sale of coal assets in Mozambique", Media Release, July 30, 2014. ↑ 3.0 3.1 Agnieszka Flak and Marina Lopes, "Poor railways, ports put brake on Mozambique's coal rush", Reuters, April 16, 2013. ↑ 7.0 7.1 Rio Tinto, "Recommended A$16 per share cash offer by Rio Tinto for Riversdale", Media Release, December 23, 2010. ↑ Rio Tinto, "Rio Tinto assumes control of Riversdale Mining Limited", Media Release, April 1, 2011. ↑ Doug Ritchie, CEO Energy Rio Tinto, "Investor Seminar", Rio Tinto, September 2011, page 24. ↑ Doug Ritchie, CEO Energy Rio Tinto, "Investor Seminar", Rio Tinto, September 2011, page 27. ↑ Doug Ritchie, CEO Energy Rio Tinto, "Investor Seminar", Rio Tinto, September 2011, page 28. ↑ 13.0 13.1 Doug Ritchie, CEO Energy Rio Tinto, "Investor Seminar", Rio Tinto, September 2011, page 29. ↑ Doug Ritchie, CEO Energy Rio Tinto, "Investor Seminar", Rio Tinto, September 2011, page 30. ↑ 17.0 17.1 Rio Tinto, "Rio Tinto results for the year ended 31 December 2012 ", Media Release, February 14, 2013. ↑ Rio Tinto, "Rio Tinto impairments and management changes", Media Release, 17 January 2013. ↑ 19.0 19.1 Gillian Tan and Alex Macdonald, "Rio Tinto Considers Sale of Mozambique Coal Unit", Wall Street Journal, June 25, 2013. ↑ Michael Hobbs, Anthony Macdonald and Angela Macdonald-Smith, "Rio Tinto set to dump Mozambique coal: reports", Australian Financial Review, June 26, 2013. (Subscription required). ↑ 21.0 21.1 Rio Tinto, "Rio Tinto Coal Mozambique", Rio Tinto website, accessed May 2013. Andrew Woodley, Executive Director, Riversdale Mozambique Limitada, "Riversdale – a new supply of hard coking and thermal coal", Rio Tinto, June 5, 2011. This page was last edited on 7 August 2017, at 04:04.